Impressive&Powerful Sound Quality: This Bluetooth speakers will provide a full-bodied stereo sound with enhanced bass and powerful volume. Thrilled audio and funky vibes satisfied your ears by diaphragm compression drive and double 45MM amplifiers. Extraordinary Battery Life & Worked as Power Bank: With built-in 4500mAh lithium battery, only need to charge around 4 hours，this Bluetooth speaker can guarantee up to 12 hours playtime in 75% volume. And there is a USB interface, it can also work as a mobile power bank,but for it has just 4500mAh battery, we suggest just using this as an emergency function. 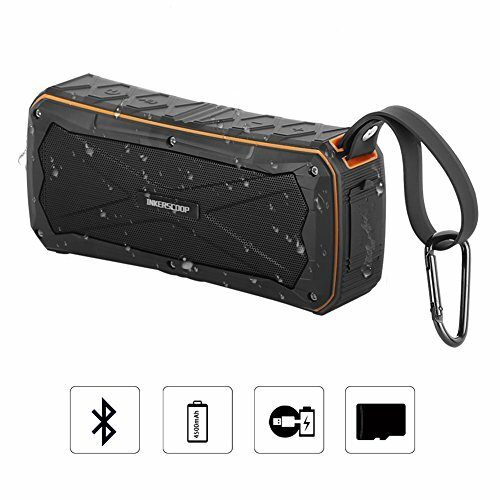 Portable& Easy to Control Design: With a strong lanyard tied on the wireless speaker, and we also provide a extra hook for you, very convenient to carry this Bluetooth speaker when climbing, hiking, running,biking and so on. Equipped with Bluetooth 4.1, compatible with all Bluetooth compacity devices. Durable &Resistant & Multiple Connections: Strong shell, No worry about dropping or broken.IPX6 waterproof level, works in rains with no problem. This wireless speaker can not only work on Bluetooth, but also support Micro SD and AUX capability, more choices for you to enjoy the music world! WARRANTY:We promise 6-months warranty. Return(within 30 days), Exchange (The first 60 days). Any problems with your Bluetooth speaker, please contact us via inker-us@outlook.com . We will try our best to solve it.